A Mirascope is an optical illusion box that projects an image in space above the box. It is like a hologram but is not a hologram. The image is created completely with mirrors. The image is 3-D and extremely realistic, so much so that when someone looks at it they are certain that it is there, that is, until they try to touch it! I make a beautiful turned Black Cherry wood box that holds the Mirascope. The box is approximately 6" in diameter and 2.5" high. Included is a wood-sphere-lid that fits the opening of the box. If the lid is on the box and someone lifts it, the image will pop out. You can put almost any small object in the box and it will project up into the air above the box (see photo). The one I sell includes a small frog that projects above the box. I glue this frog in place so it doesn't move. 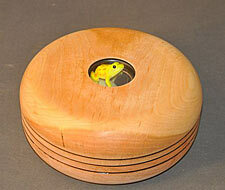 If you wish to use your own object in the box, let me know and I won't glue the frog in place. One of my customers put a diamond ring in the bottom. Others find buttons, gems, etc. work well. I'm looking for an eyeball (glass one, of course) to put in one of my display models. Little people (AKA, kids and grandkids!) love them for "Show 'N Tell". Also, big kids (AKA, executives) love them on their desk as a conversation piece. They also work well in almost any area of the house where you need that "little extra" to spice things up! I make these from Pennsylvania Black Cherry from my property (I no longer make them from Oak). They are truly a handsome piece of art and a very unique gift!